A dead sea turtle draped in plastic trash. This story is part of a series onocean plastics. Every year,billions of poundsof plastic waste ― grocery bags, drinking straws, even cigarette butts ―pour into our oceans. Used by humanity for a few minutes at most, these single-use plastics likely willlikely stick around for decades, or longer. Trillions of pieces of refuse get trapped by natural ocean currents, or gyres, at five locations, causing a dance of debris for hundreds of thousands of square miles. While these gyres, geographically removed from civilization, hold much higher concentrations of trash than other regions of the ocean, they’re evidence of a growing problem humans have mostly ignored since weembraced widespread plastic use 50 years ago. But now, researchers are ringing a warning bell: Our reliance on cheap, disposable stuff is smothering the seas, and it’s bound to get worse. Marcus Eriksen, a co-founder of the conservation group 5 Gyres, likens this growing horror to smog that covers cities like Los Angeles and Beijing. It’s an apt description. Over time, a plastic item in the ocean breaks down into many tiny particles, known asmicroplastics ― so many, in fact, that if you were to stand on the bottom of the ocean in the middle of a gyre and look up, the water overhead wouldn’t look clear, Eriksen said. Perhaps the smoggiest of these gyres is the Great Pacific Garbage Patch, hovering a few hundred miles north of Hawaii. Reports describe it as a floating island of trash twice the size of Texas,so dense you could walk across it,and so vast you cansee it from space. But such descriptions are misleading, scientists say. Rather, it’s more like a swarm of microplastic bits. Marine debris accumulations in the North Pacific Ocean. At last estimate, there were some5.25 trillion pieces of plastic trash floating along the surface of the ocean. Waves, salt and UV radiation from the sun will eventually break down these items into microplastic particles, each less than 5 millimeters long. If you tried to account for not just the large pieces of plastic bobbing about, but also the particles, you’d be looking ata number close to 51trillion, or “500 times more than the stars in our galaxy,” according to the United Nations Environment Program. By now, plastic bits are so pervasive they’ve spread to some of the furthest reaches of the globe. Just last month, scientists said ocean plastic has started washing up in the Arctic for the first time. And, like its airborne namesake, this oceanic haze has not been harmless. Recent studies have linked the growing amount ocean plastic to a host of health impacts in marine creatures. 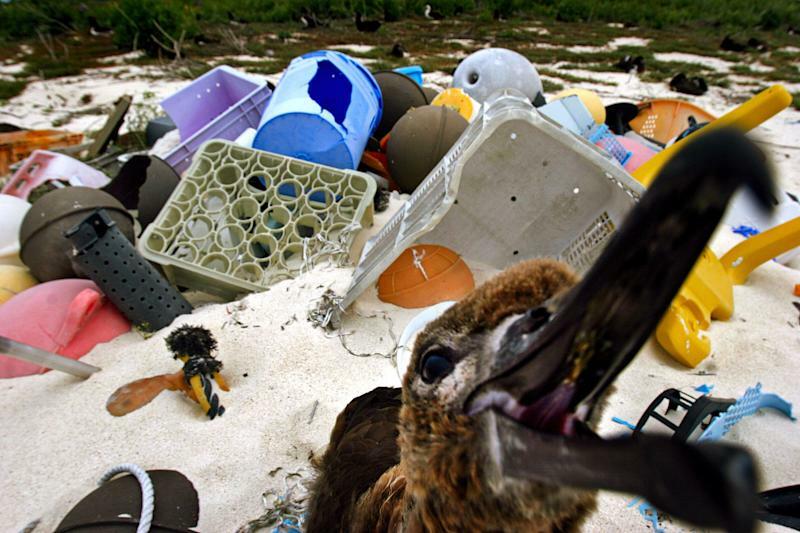 Dramatic photographstaken in 2011 were among the first to show such devastation: rotting albatross carcasses on Midway Atoll, a remote island in the North Pacific right in the middle of the region affected by the Great Pacific Garbage Patch. The images showed more than a dozen bird skeletonsstuffed with colorful bits of plastic. Their stomachs were so full of the material that scientists said the animalsdied from malnutrition. Albatrosses have become a bellweather species for the plastic pollution problem, ingesting the material and dying en masse. Researchers have since discovered that plastics bobbing in the ocean can pick up scents that marine birds have long associated with food sources. Albatrosses have a sharp sense of smell and will inadvertently gobble up a pen cap that smells like fish, for instance. These impacts have spread as the trash multiplies. A paper published in 2015 found186 species of seabirds are now at risk of plastic ingestion. It estimated that by 2050,99 percent of all seabirdswill have eaten plastic at some point in their lives. Qamar Schuyler, a scientist with Australia’s Commonwealth Scientific and Industrial Research Organization, has documented a similar phenomenon in sea turtles. In a blog written for Greenpeace last year, Schuyler said that during her time as a biologist at The University of Queensland, about 30 percent of the turtles she performed necropsies onhad plastic in their stomachs. Schuyler speculated the turtles were confusing things like plastic grocery bags for jellyfish, a primary food source. But people aren’t eating plastic particles, right? Actually, science says yes, we are. A recent study foundabout one-fourth of seafoodsampled from fish markets in California and Indonesia had plastic in their guts. While the link between fish entrails and our own stomachs isn’t fully understood (fish guts are usually removed before the fish reaches the dinner table), another study conducted among Europeans who ate large amounts of filter-feeding mussels and oysters found some humans consumeup to 11,000 microplastic pieces per year. 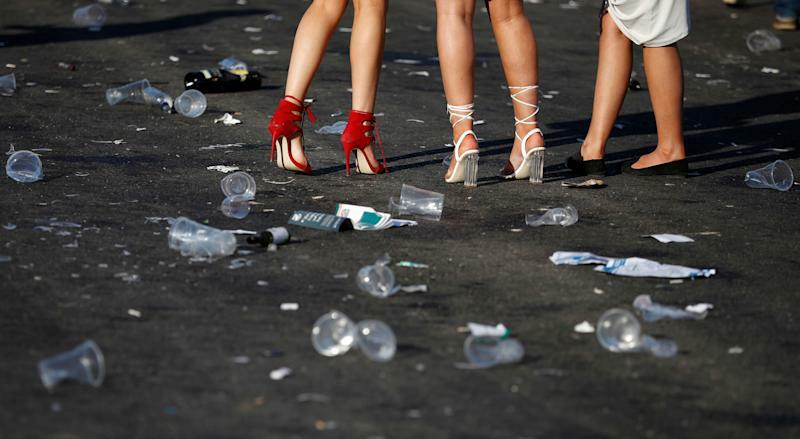 It’s unclear what all of this ingested plastic can do to human health. “Our understanding of the fate and toxicity of microplastics in humans constitutes a major knowledge gap,” the U.N. Environment Program noted in a 2016 report. The vastness of the marine debris problem has prompted dozens of grand repair efforts. A project calledThe Ocean Cleanup, founded by an inventor named Boyan Slat when he was 18, aims to create a 62-mile, underwater, V-shaped barrier to trap plastic trash as it floats along ocean currents. Slat said the technology, which he hopes to deploy by 2020, could removehalf of the trash from the Great Pacific Garbage Patchwithin a decade. 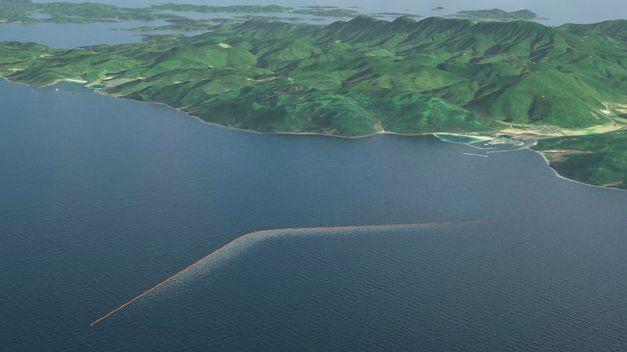 A mock-up of the Ocean Cleanup's ocean barrier that hopes to clean up the world's seas. But scientists have cast doubt on such plans, saying efforts to clean up what’s already in the ocean area distraction from the cause of the problem. 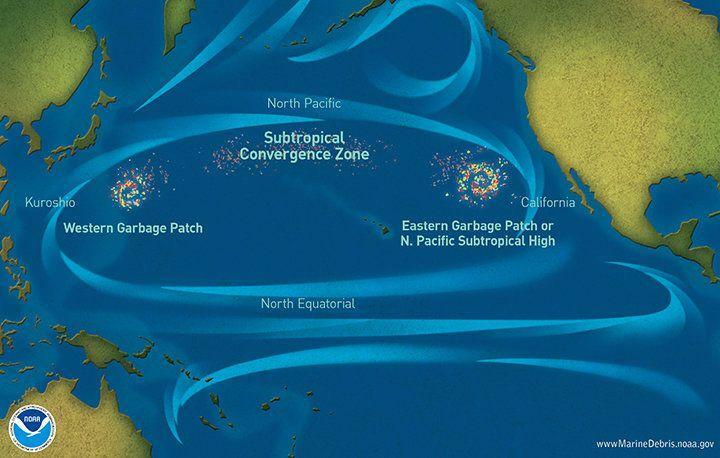 “Unfortunately, cleaning up the garbage patches is pretty complicated,” NOAA wrote in aJanuary blog. “Since the debris making them up is not only constantly mixing and moving, but also extremely small in size, removing this debris is very difficult. Eriksen calls such talk the “ocean cleanup fallacy,” and said efforts should actually focus on industries that create all the single-use plastic in the first place, and the consumers who use it. 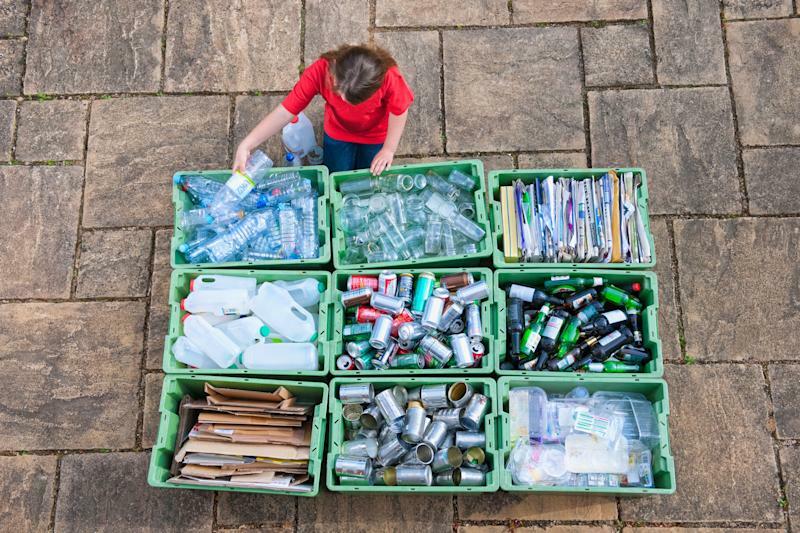 Recycling rates in the U.S. have plateaued in recent years, and only aboutone-third of the country’s waste is recycled, according to the Environmental Protection Agency. Up to75 percent of the waste stream could be reusedif it were disposed of in the proper channels, the EPA said. In the meantime, trash keeps accumulating in marine waters. A recent report estimated that by 2050, there could bemore plastic in the ocean, by weight, than fish.Eriksen noted that scientists now say the Anthropocene ― the next geological epoch that will be defined by humanity’s impact ― will almost certainly be linked to the prevalence of plastic around the planet. Eliminating plastics entirely from our lives isn't feasible, but we can all start minimizing our plastic waste (and really, all waste in general) ― that includes recyclable plastics and compostable or biodegradable ones too. “If we really want to deal with the waste problem we’re facing, we need to think deeper about the nature of consumption itself,” Minter said. This might seem straightforward, but preventing litter is a critical action to ensure that our plastic waste gets properly disposed of and doesn’t end up in our seas or other environments. According to Jambeck, mismanaged waste like litter is the number one cause of plastic garbage is the world’s oceans. That plastic bag that got caught in a breeze could end up in a storm drain; that empty plastic bottle left on a beach could get carried out by a tide. Ocean Conservancy recommends always “taking five” whenever you leave a space to ensure that you’ve collected all your trash and disposed of it properly. Plastic bags, which often can’t be recycled (more below), are especially prone to becoming litter as they are easily carried away in the wind (yet another reason to not use them!). If you must throw one away though, be sure it’s balled up or weighed down so it can’t easily float away. Recycling plastics, it turns out, is much more complicated than you might think — it’s so complex, in fact, that a significant amount of discarded plastics (even the ones you put into the recycling bin) don’t end up being recycled. In general, less than 7 percent of all the plastic that Americans throw away each year are recycled and about 8 percent is combusted in waste-to-energy facilities. The rest end up in landfills. The reasons for these low numbers are manifold, said Darby Hoover, a waste management specialist with the Natural Resources Defence Council. But generally, it boils down to two major problems: one, there are many different kinds of plastics and not all of them are easily recycled; and two, consumers often aren't aware of these differences and therefore don't dispose of plastics in the best way. “You know that little triangle on plastic products? The little triangle is not an indicator that something is recyclable. Instead, it’s merely a designation — numbered 1 to 7 — of what kind of plastic it is, what polymer that plastic is,” explained Hoover. A number 1, for instance, indicates that the item is made of Polyethylene terephthalate (or PET, for short), a material typically used to make bottles and microwaveable food containers; while a number 2 indicates high-density polyethylene, the stuff plastic grocery bags are usually made of. The most complicated designation is number 7 which indicates all other plastics, including products with a mixture of various plastics in them and also compostable plastics. Recyclers use these numbers to determine which items can be recycled at their facility and which can’t. Different kinds of plastics typically can’t be recycled together, and many facilities won’t accept certain types of plastic at all, like styrofoam, vinyl and plastic film products like plastic bags and cling-wrap (these products have been known to gum up recycling equipment). 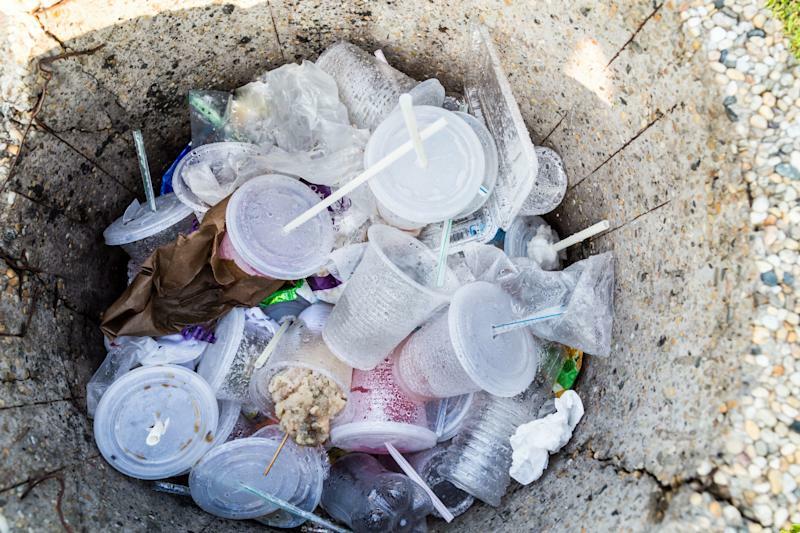 To add to the confusion, local municipalities across the U.S. have differing rules when it comes to recycling plastics. Some might accept type 7 plastics, for instance, but others will not. “No matter where you live, you have to check the local municipality for their rules,” said Hoover, who recommended reviewing your local city or town website for more information. You also have to continue checking in, she added, as these rules often change without much warning. Studies have found that microplastics — plastic fragments less than 5 millimeters long — can get washed out of synthetic clothing, like those made of polyester or acrylic. 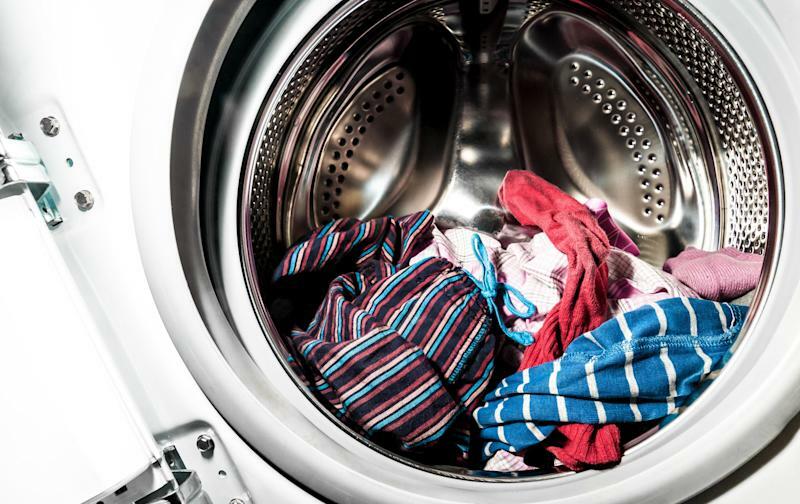 A single cycle of a washing machine could release more than 700,000 microplastic fibers into the environment, concluded one 2016 paper. Natural fabrics to consider instead include organic cotton, wool, flax and hemp. Plastic microbeads are sometimes added as an exfoliating agent to personal care and beauty products like face scrubs, soaps and toothpaste. These tiny plastic pieces can pass unfiltered through sewage treatment systems and end up in local waterways, and eventually the sea. Recognizing the potential risk that microbeads pose to marine environments and possibly human health, several countries, including the U.S. and the U.K., have introduced bans of the substance. 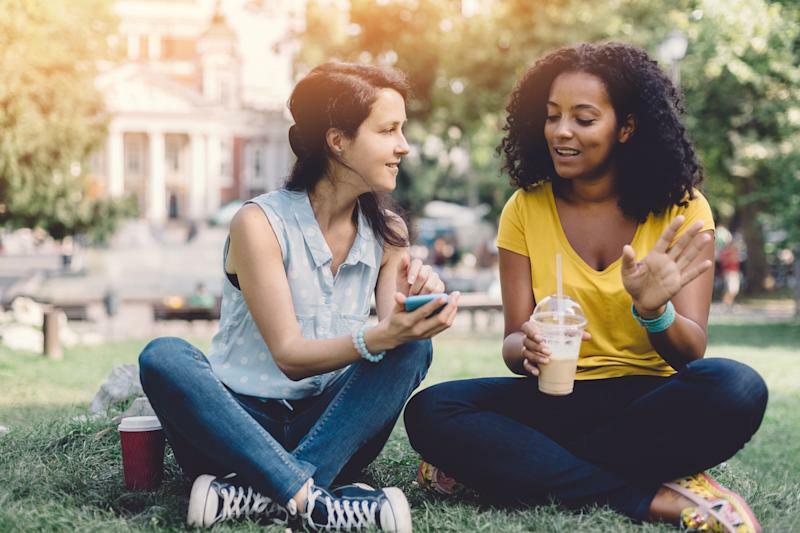 Many of these bans have yet to be enforced, however, and some are limited in scope, so remain vigilant when purchasing products that could have microbeads in them (look out for terms like “exfoliator,” scrub,” “buff” and “polish”). Visit the Beat the Microbead website to learn more. 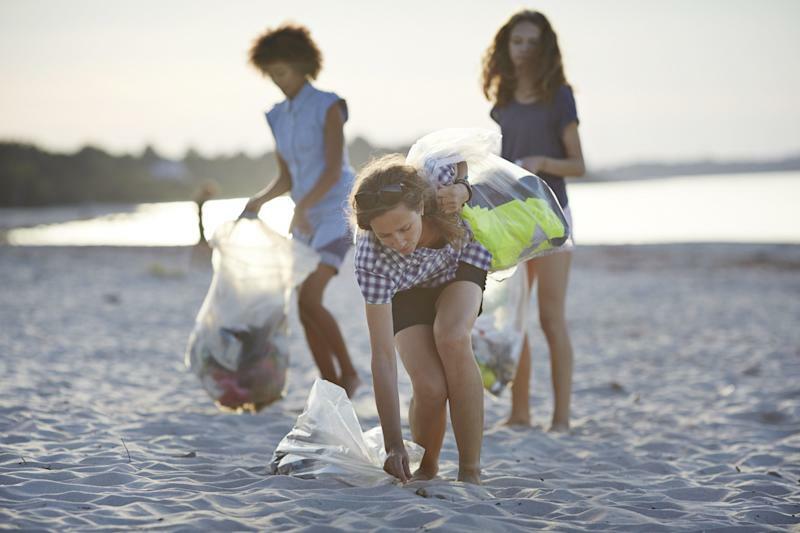 Every year, Ocean Conservancy organizes the International Coastal Cleanup, a global event that asks volunteers to collect plastic and other garbage from coastal areas and waterways. Last year, more than 700,000 people in more than a 100 countries participated in the event, collecting more than 18 million pounds of trash in a single day. In 2017, the cleanup event is planned for September 16 ― but you don’t have to wait till then to do something. Ocean Conservancy has a DIY toolkit to help you organize clean-ups in your own community. Using a plastic bag for groceries may seem convenient, but the ubiquitous sack is one of America’s greatest waste challenges. An average American family of four uses more than 1,500 plastic bags every year, according to the NRDC. Each bag is typically only used for about 12 minutes; yet since plastic bags are very rarely recycled, most of them end up in landfills where they can languish for many hundreds of years. Reducing your use of plastic bags is one important way to mitigate this waste problem; but according to Jennie Romer, a New York City lawyer and founder of the website Plastic Bag Laws, another way to make a big impact is to support local, state and federal single-use bag legislation -- specifically legislation that supports the reduction of all kinds of single-use bags including plastic and paper. Across the country, there are already many ordinances in place related to single-use bags. Last year, California became the first state to ban single-use plastic bags at all retail outlets, and in 2010, Washington D.C. implemented a 5-cent fee for all single-use bags, both plastic and paper. 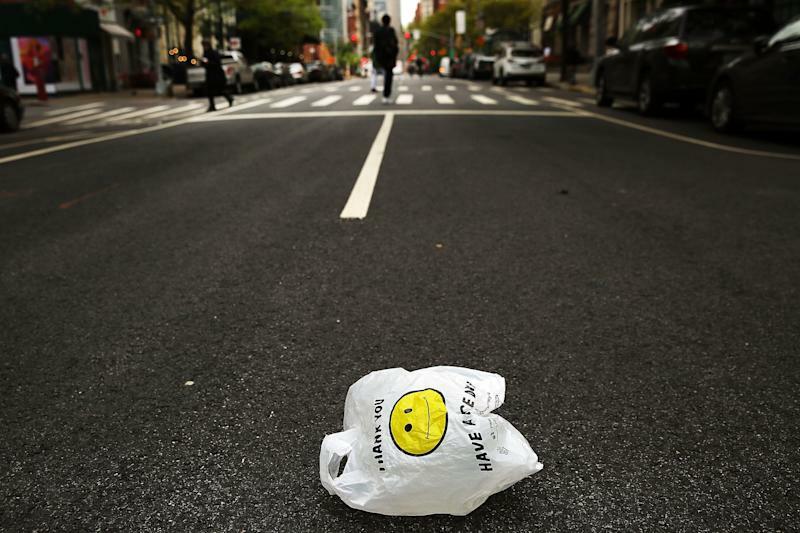 Cities and towns in Texas, Hawaii, Massachusetts and Colorado, among other states, have also embraced single-use bag legislation in some form or other. Preliminary evidence suggests that single-use bag legislation can be very effective in reducing waste. In Ireland, for instance, where a plastic bag tax was introduced in 2002, plastic bag use reportedly dropped by more than 90 percent in just a few weeks. In San Jose, California, a 2011 plastic bag ban resulted in a reduction of plastic litter by “approximately 89 percent in the storm drain system, 60 percent in the creeks and rivers, and 59 percent in City streets and neighborhoods,” according to a city report released almost a year after the ban was put in place. Find out more about plastic bag legislation around the country and how you can get involved by visiting the Plastic Bag Laws website. Use your dollar to support companies and entrepreneurs that are doing their part to reduce plastic waste in their business. 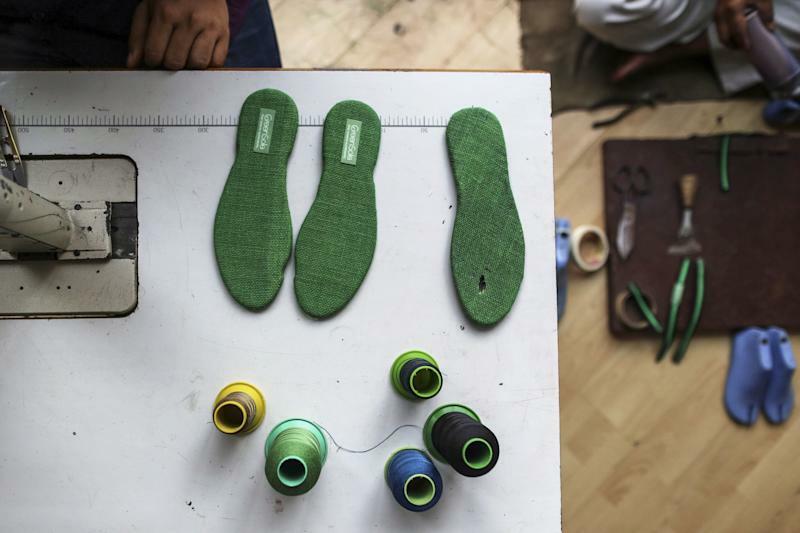 They might be rethinking product design, like this deodorant brand with its reusable, refillable containers; or incorporating recycled materials into their goods, like activewear companies that are turning plastic bottles into clothing or social enterprises like Greensole (pictured) that recycles old shoes into new ones. There are also companies out there that are attempting to reduce waste across their entire value chain. Take Dell, which is recycling old computers into new ones as part of its closed-loop recycling supply chain. The company has also started harvesting ocean plastics to turn it into packaging material. Consider also supporting green groups like 5Gyres, Ocean Conservancy and The Ocean Cleanup, which are leading the fight to clean up the world’s oceans. Waste is not an issue people often talk about, but for change to occur, the conversations need to start. The dialogue can begin in your own home and among your own friends. Start engaging your loved ones and your community on this important issue. Start paying attention to the amount of plastic you use and waste on a daily basis. 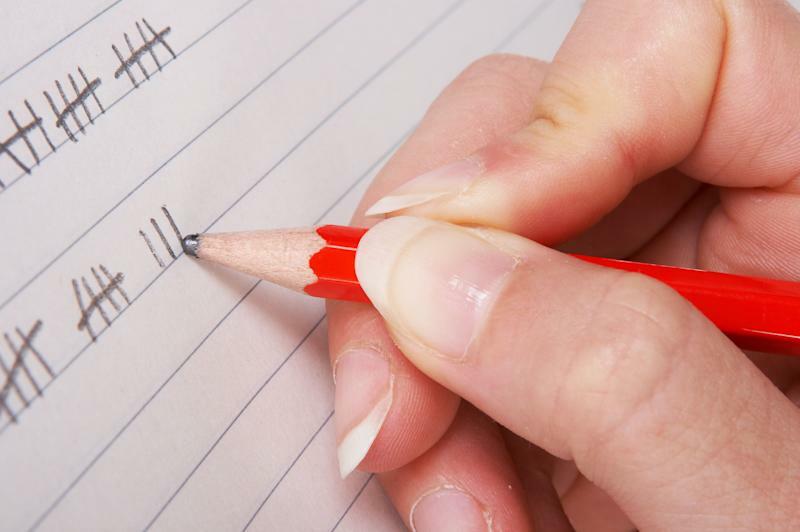 And as you start cutting back on your consumption, jot down a tally of all the plastics you “save.” You’ll likely be amazed. Ocean Conservancy also has a Clean Swell App which lets you track your beach cleanup efforts. It lets you share your progress on social media and to submit data directly into a global ocean trash database.